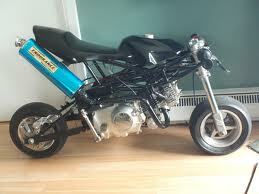 So you buy your first pocket bike, or maybe you buy your first major upgrade. It's a great looking bike, you go to show it off and realize there are two other people who have the exact same bike. That takes the wind out of the sails a bit, but the good news is that it does not have to stay that way. One of the nice things about pocket bikes is that you don’t have to buy a customized bike to have one! 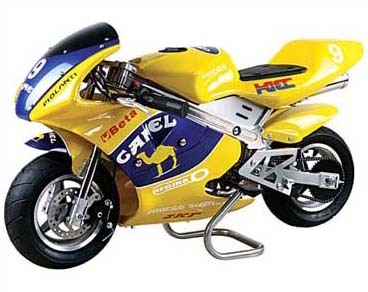 You can change your pocket bike’s appearance, upgrade its performance, and transform your machine into a custom pocket rocket you can be proud of. You’ll find all the tools, parts, and accessories you’ll need at pocket bike chop shops. Turn your normal stock pocket bike into your personal custom pocket rocket! If you’re not sure where to find the parts you need, a good place to start is at one of the numerous mini bike forums or that have recently rolled into action on the Internet. There you’ll find an enthusiasts' community with unsolicited testimonials (because have you ever seen a company's website with a bad testimonial?) from members— other bikers, who’ll tell you where they’ve found the best deals, and even more importantly, they’ll tell you where and what to avoid at all costs! You don't have to look the same as everyone else. Make your custom pocket bike look as good as it rides. Between the Internet and chop shops you will have a wide choice of accessories to make you custom bike stand out from the rest of the group with accessory designs, saddles and saddlebags, trunks, tanks and tank pouches, headlights, horns, chromed wheels, decal kits, etc. 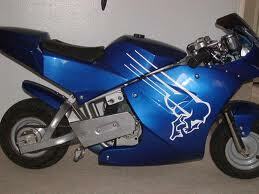 If you've seen something done to a pocket bike, you can probably either get it or do it to your own!